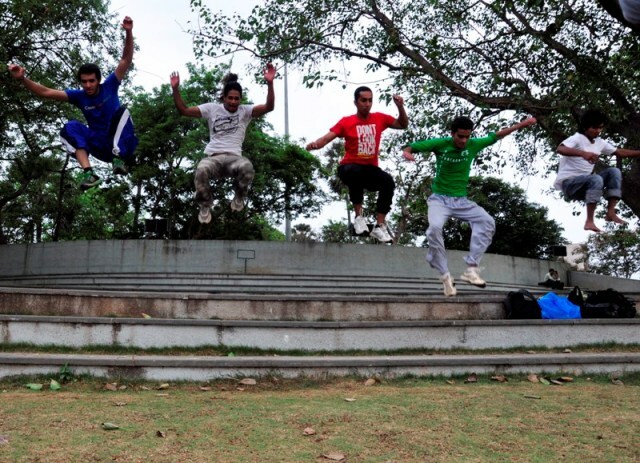 The French sport Parkour seems to have caught the fancy of the youth in cities such as Mumbai and Delhi. Considered as a viable alternative by many to regular gym workouts and yoga, Parkour is described as the activity or sport of moving rapidly through an area, typically in an urban environment, negotiating obstacles by running, jumping and climbing. In short, the sport does not require any equipment and one needs to ideally make the best use of one’s natural surroundings to practice the same. Story Soviets spoke to popular TV and film actor Karan Chhabra, an ardent fan of Parkour. Karan was last seen in his real life avatar in the popular show “The Serial” on Channel V. He was also signed on as a second lead in Tiger Shroff’s debut film “Hero-Panti” that went on the floors this year. Meanwhile, The Serial was a show with a difference where celebrities played out their real life roles. However the surprise element of the show was Karan, the proud winner of the first season of the popular reality show “SuperStud” on UTV Bindaas that was hosted by Ashmit Patel. Ans: I was drawn to this French martial art five years back and since then I have been practising Parkour. The Step up series of movies also inspired me to take up Parkour. Being a trained dancer, I believe it is very good in helping build stamina and maintain a fit body. Ans: Yes I do, because one needs good parks and most importantly good open spaces. Delhi has these, however Mumbai largely doesn’t which is why it is a challenge to practice it here. Additionally one needs adequate safety gear, special shoes with a soft and good sole and a safety pad. In fact I try and practice Parkour whenever I can in open spaces or places that I travel to. Ans: The best thing about Parkour is that it is a great way to maintain your body, burn body fat, keep your weight under control, gradually increase stamina and look slim and smart in the process as well. Additionally it also helps one stay lean to a certain extent. While practising Parkour one needs to keep both the body and the mind alert. If one is truly serious about practising this sport, it is easy to learn. It took me just over a fortnight to learn Parkour. Yes I think Parkour can replace traditional exercise such as gyming or yoga. Ans: Parkour needs strength and stamina however regular gyming does not need that much strength atleast not as much as Parkour. If I had a choice, I would choose Parkour as it is a complete body exercise and does not require any equipment as well. Moreover I believe one would never ever get bored of this sport. Ans: Yes I would advise my fans to take up Parkour especially if you have a passion, a willingness to take risks atleast in the beginning and an openness to learn. However one is well-advised to know that you also need a lot of stamina to take up the sport. So are you guys up for the challenge. Do you feel it is worth taking the plunge and trying your hand at Parkour. Let us know what you think. So What Are You Doing This Valentine’s Day? How About Celebrating This New Year, With The Foodie In You? ← Restraunt Review: The Yellow Chilli & Stir Crazy – Good Combination Of Spice And Fun! Reblogged this on Sykose Extreme Sports News. Flavors of Karwar at Hotel Kohinoor Continental, Andheri (East)! Pretty on the Eyes, Easy on the Pocket: My Super Special Sunday Brunch at Sorrentina By Foodhall! Movie Review: Badla – An Intriguing Whodunit That Is High On Drama, Twists And Turns! #IndiaForKerala: Here’s how you can contribute to Kerala flood relief!